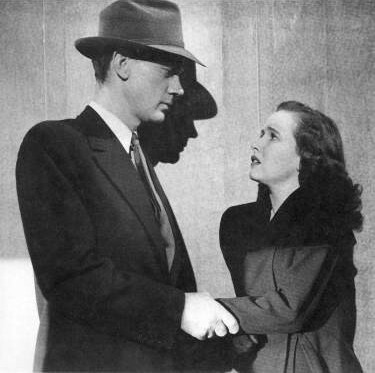 SHADOW OF A DOUBT is filled with colorful supporting characters, not the least of whom are the members of the Newton family: Patricia Collinge as Emma Newton, Henry Travers as her husband Joe, Charles Bates as Roger (the younger brother), Teresa Wright as Young Charlie Newton, Edna Mae Wonacott as Ann (the younger sister), and Joseph Cotten as the murderer-in-residence Uncle Charlie. 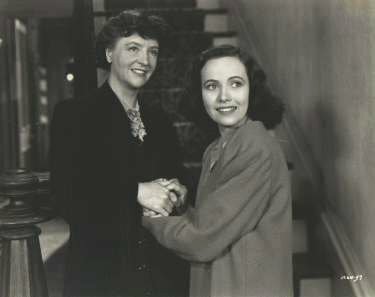 Patricia Collinge (at left with Teresa Wright) radiates sincerity as Mrs. Emma Newton, the flighty small-town housewife and mother who adores her younger brother Charles and from whom her daughter must hide her growing suspicions. Though worthy, Wright, Cotten and Collinge all went unrecognized at Oscar time. 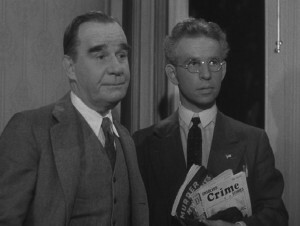 Also a standout among the supporting characters is Hume Cronyn, playing the Newton's next-door neighbor Herb Hawkins who, along with Mr. Newton (Henry Travers), enjoys reading and occasionally plotting murder mysteries. 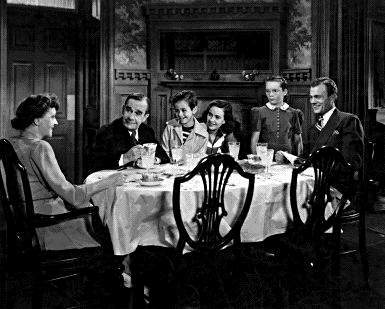 Their conversations add a macabre element of humor to the film, and in an example of typical Hitchcockian irony, the two amateur sleuths fail even to recognize the mystery unfolding before them, let alone solve it. 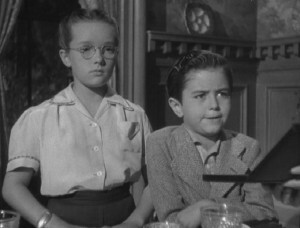 While the youngest members of the Newton family, Ann and Roger, also play a comic role in the film, their constant banter serves to disrupt the peace in the home as well, contributing to the growing tension. Roger (Charles Bates) is always spouting useless information and shouting to be heard, while his older sister Ann (Edna Mae Wonacott) is a know-it-all bookworm who senses things she is still too young to understand. "The cities are full of women, middle-aged widows, husbands dead, husbands who've spent their lives making fortunes, working and working. And then they die and leave their money to their wives, their silly wives. And what do the wives do, these useless women? You see them in the hotels, the best hotels, every day by the thousands, drinking the money, eating the money, losing the money at bridge, playing all day and all night, smelling of money, proud of their jewelry but of nothing else. Horrible, faded, fat, greedy women . . . Are they human or are they fat, wheezing animals, hmm? And what happens to animals when they get too fat and too old?" --Uncle Charlie. "We're not talking about killing people. Herb's talking about killing me, and I'm talking about killing him." --Joe Newton. "I never make up anything. I get everything from my books. They're all true." --Ann. "I don't want you here, Uncle Charlie. I don't want you to touch my mother. So go away, I'm warning you. Go away or I'll kill you myself. See, that's the way I feel about you." --Young Charlie Newton. "Mothers don't lose daughters. Don't you remember? They gain sons." --Young Charlie Newton. "He thought the world was a horrible place. He couldn't have been very happy, ever . . . He didn't trust people. Seemed to hate them -- hated the whole world. You know, he said people like us had no idea what the world was really like." --Young Charlie Newton. "Well it's not quite as bad as that. Sometimes it needs a lot of watching; seems to go crazy every now and then -- like your Uncle Charlie." --Jack Graham. "You think you know something, don't you? You think you're the clever little girl who knows something. There's so much you don't know . . . so much. What do you know really? You're just an ordinary little girl living in an ordinary little town. You wake up every morning of your life and you know perfectly well that there's nothing in the world to trouble you. You go through your ordinary little day and at night you sleep your untroubled, ordinary little sleep filled with peaceful, stupid dreams . . . and I brought you nightmares." --Uncle Charlie.